Robert Borboro of Cross Creek RV Park north of Acadia, Fla. served the better part of two years in Korea during the war. 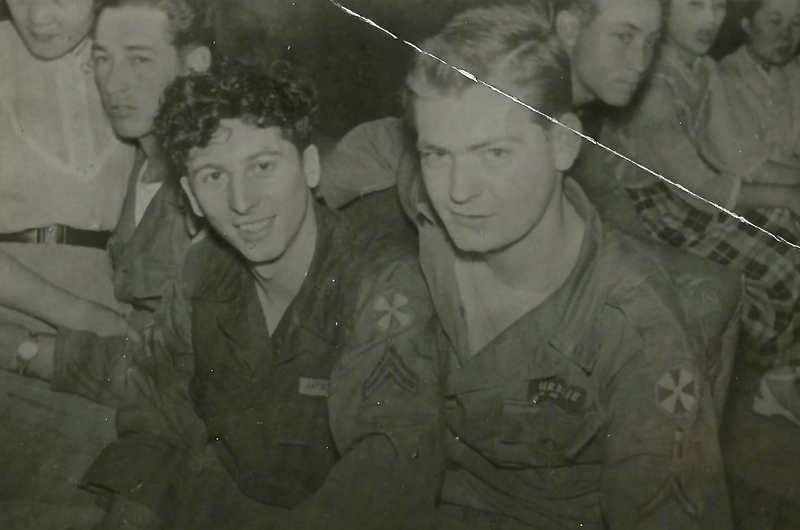 It’s been 60 years since he was a corporal in the 97th Engineering Battalion attached to the 1st Infantry Division based at Young Dong Po and his memory is not what it once was. 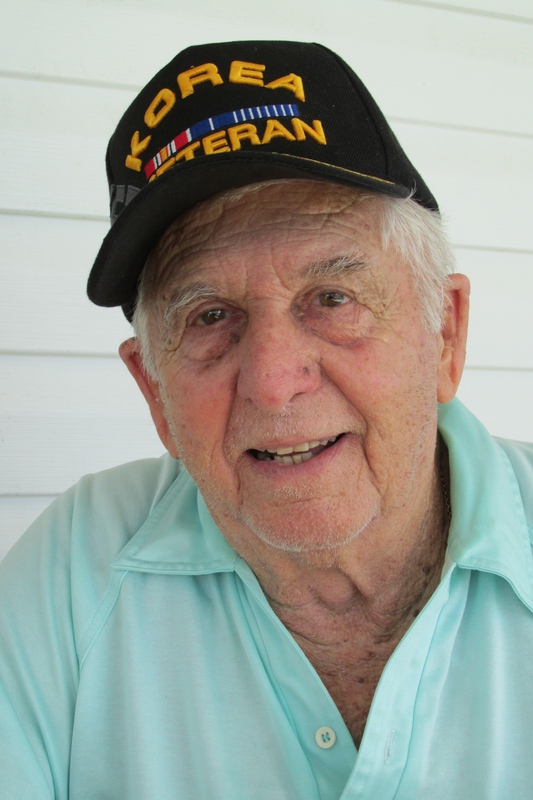 “I was drafted at 19 in 1952 and went to boot camp at Fort Leonard Wood, Mo.,” the 83-year-old De Soto County resident recalled. “After basic we took a four-engine ‘Constellation’ airplane and flew to San Diego, Calif where we got aboard a troop ship for Korea. It took us two weeks to get here. “My MOS said ‘Engineer,” but I was trained as an electrician. I ended up at a supply base in Young Dong Po, about 15 miles south of Seoul. The closest town had a couple hundred people,” Borboro said. “My first night at the supply base we had an air raid. The attack consisted of a North Korean plane about the size of a single-engine Piper Cub that flew over in the middle of the night and dropped hand grenades on our ammo dump and oil storage tanks. By the time one of our fighter-jets got airborne to shoot him down he was gone. The closest Cpl. Borboro ever got to a shooting war he and a buddy were stringing phone cable on poles and became targets for enemy snipers. “The snipers were hiding out with the people in the nearby town. I was running an overhead wire on a pole when I got shot in the hand,” he said. “My buddy and I were on this pole with the wire. I was at the top and reached for the wire. At that instant I heard this–Pow! Pow! My buddy, who was below me, got hit in the stomach by one of the rifle bullets. I was lucky, the second bullet just grazed the top of one hand and put a bullet hole in the leg of my fatigues. “After I got hit I swung around on the belt that was holding me to the pole and put the pole between me and the enemy snipers. Then I came down the pole in a hurry. By then my buddy was on a stretcher being carted off to a nearby MASH unit. He was hurt pretty bad. “My hand was all bloody, but after they cleaned the blood off they discovered that my wounds were minor. They decided to bandage my hand right there in the field. I didn’t even get a Purple Heart,” Borboro said. “One day I was up to Seoul picking up some equipment and all of a sudden I heard all these whistles blowing. The Chinese Communists were coming from the other side of town attacking our Green Berets while blowing their whistles. I had a Jeep so I got the hell out of there in a hurry. “Another time I was in Seoul about the time hundreds of Koreans were holding a street demonstration. They were marching shoulder-to-shoulder down the main street. Shortly after I pulled up an MP grabbed me out of my Jeep just as the demonstrators marched by. He probably saved my life because they tore my Jeep to pieces,” Borboro recalled. “I remember I almost shot this civilian. They eat dogs and cats over there and this guy was dragging this poor dog behind him that had a wire run through it’s mouth. The dog was in bad shape. “I pulled my carbine I was carrying from my shoulder and drew down on this guy who was mistreating the dog. About that time a buddy stopped me from shooting him. My buddy explained to me how poor the Korean culture was. You can’t blame the man because he really had nothing else to eat. “The worst part of Korea was the supply of whiskey the American soldiers had. In Vietnam it was drugs, in Korea it was whiskey. There were lots of soldiers in Korea walking around drunk and armed,” he said. “A buddy of mine was walking around drunk while carrying a .45 pistol. He got in an argument with a young soldier from Oregon who was playing music too loud. My buddy didn’t like the loud music. The next morning when the two got up they continued their argument about the music. My buddy pulled out his .45 and shot him right there. “Then he walked over to a Puerto Rican kid, a couple of bunks over who was also sitting there writing a letter home, too. He asked him if he wanted a piece of cake and got the same answer. Robert Borboro, left, sits with a buddy sometime during his two-year tour in Korea during the Korean War in the 1950s. “With that the guy with the cake pulls his carbine off his shoulder, points it at the Puerto Rican kid and squeezes the trigger. He puts a line of bullet holes right down the middle of the soldier. Barboro was only supposed to have a nine month tour in Korea. He spent 18 months overseas because he was an electrician and they were in short supply over there. “I went through nine months of war and nine months of both sides in the war arguing about the shape of the table use in the negotiations. When I sailed home from Korea in 1954 there were no parades for us back in the USA like they had at the end of World War II. In civilian life he became a union electrician and went to work for Federal Sign and Signal Corp. of St. Louis. “Flo and I had a wonderful life. We knew what good times really were. We were old enough to remember the Depression, but when we went to work in the 1950s everything in the U.S. was booming,” Barboro said. The couple has four children: Tony, Valerie, Phillip and Christi. This story was first published in the Charlotte Sun newspaper, Port Charlotte, Fla. on Monday, July 27, 2015 and is republished with permission. Click here to view Borboro’s collection in the Library of Congress. I know how he feel’s when you can’t remember things like you could. I can tell you this, tho’, he’s in good shape considering his advanced age. When I went back to Arcadia to get a current picture of him, he was standing on a ladder repairing the outside lamp on the front of his house.